Chiropractic is about using your head, heart and hands to get people better. With drugless, surgery-free chiropractic care, our goal is to restore function to tissues, motion to the joints, and strength and stretchability to the muscle. We also look at each patient as a whole rather than as an independent part. Sometimes, taking care of one part of a person, such as their hip, resolves another issue in their body, such as ankle pain. 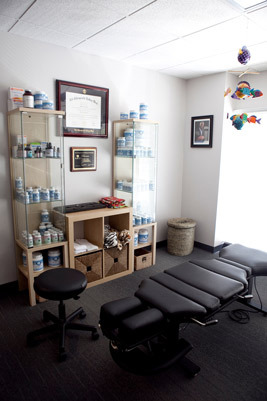 Dr. Casey provides customized chiropractic care to get the best results for his patients. If you’ve had chiropractic care in the past and have found that one technique works particularly well for you, be sure to let Dr. Casey know. It’s his goal to deliver similarly effective care to get you excellent results. Activator Methods®: This highly safe and conservative method of adjusting uses a spring-loaded instrument tool to provide a gentle and highly specific adjustment. For patients who may be uneasy about having a more forceful adjustment, Activator is a good option we have to get the joint or tissue moving better and restoring function. Active Release Technique®: Athletic injuries and many muscle-related conditions respond quickly and permanently with this state-of-the-art tissue technique. Drop Table: Also spring-loaded, this type of chiropractic table features different pieces and uses gravity as a way to generate force through the adjustment. Considered to be in the middle of the force spectrum, this technique is also gentle. Diversified: This manual type of adjustment uses more force, and you may hear a pop or cracking sound. Because it’s always our goal at Innovative Chiropractic to ensure that every patient is comfortable at each visit, Dr. Casey will ask if the pressure he applies is the right amount or too much. “I will never do anything that makes patients feel uncomfortable or nervous.” If he sees that a person is apprehensive about getting adjusted, Dr. Casey may use the Activator as it’s a lighter technique. He also may perform work using the Active Release Technique as well as recommend stretching to see if that improves the function of that area that we want to treat. If you’re ready to get out of pain and on with living your best life, contact us today to schedule a same-day appointment!